Carlos Angustia (Spanish for Worry) for his last name Augusto Cifontes. According to his relatives, he was a very disobedient boy, a very ambitious boy. He was really surrounded with the constant appetite of reaching nature and, or challenge himself to every type of sport. During his adolescence, while studying Mechanical Engineering, around 1996, a study that he founded extremely fascinating. He used to enjoy the combination of surfing and judo (hyper link photo of Carlos doing judo) for Universidad Central de Venezuela (UCV). In 1997 he began a very strong curiosity for underwater sports such as Freediving (hyperlink to image or info) and Spear Fishing (Hyperlink to image). He was so devoted to those two that he completely abandoned judo and dedicate his complete time to underwater sports; Bodyboard surfing, spearfishing and mostly Freediving. A the end of ’97, he started to check good competitive results in spearfishing and freediving quite a few first places there on a national level. Around 1999, he faces his first important decision in dedicating more time to either the fishing or the freediving. His ambitious attitude made him go to freediving a sport that at the most upcoming disciplines that year, very new extreme depths. In 2000, he had none new millennium proposition. Carlos has always been attracted to the stars, a person who carries out his passion to wonder beyond the limits of the human being. 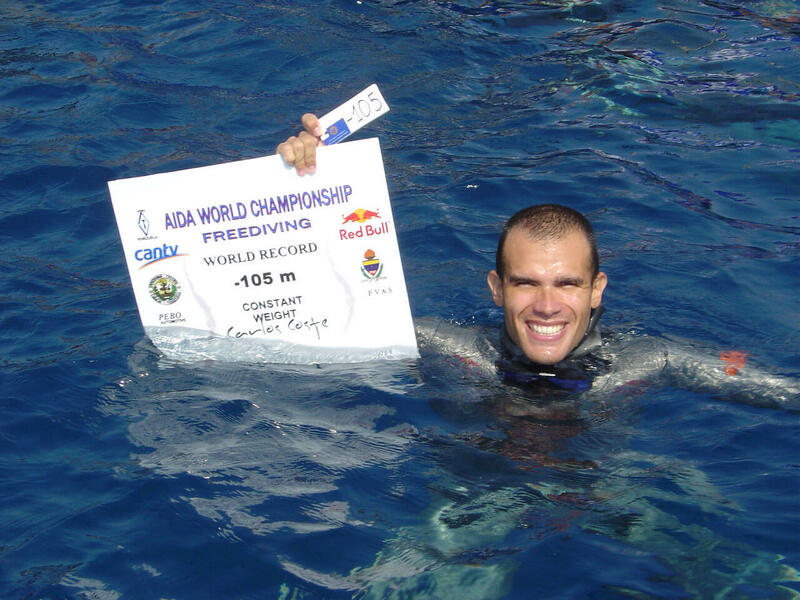 He decided to form the very first national freediving team of Venezuela to compete for the world championship of freediving at Nice by AIDA; International Association of Freediving development AIDA: hyper link in pop out to their logo and webpage). Placed third and shocked of the capabilities of the team. The following year, they were expecting to reach podium one of the members get a Disqualification and obtained place 11th. For that reason Carlos observed his abilities were at a higher level than his teammates, he visualized very outstanding and international depths. He feels the need to train individually and plans the very first world record in name of his country Venezuela. In October 2002, at Puerto Cruz, Venezuela he presented his first event “Reto en el Abismo” (hyperlink logo: challenging the abyss) put a landmark in Venezuela. A very touching victory given the recent circumstances the country has been through. Carlos gave his country two WR in Free-Immersion (FI) (-93m) and Constant Weight (CW) all within one week. Carlos had gained attention from the entire nation, he gave an audience of people, including children, and he gave them a reason keep going forward. Up until 2002, he had already broken a few records in all kind of freediving disciplines exploring new challenging depths. In 2003, together with his by then-girlfriend Gaby Contreras decide to go for a bigger event, and a much bigger world record, an event filled with a public that will make history forever. This historic event took place in the national park of Mochima, Venezuela. 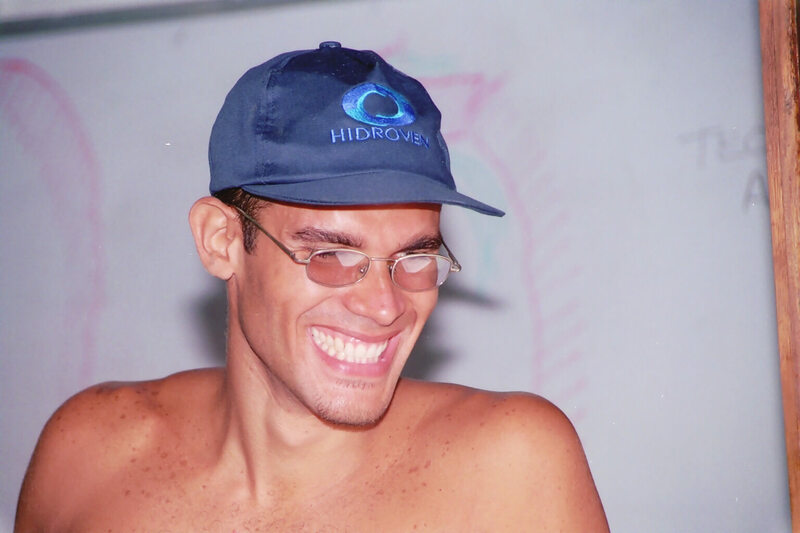 On October the 3rd that year Carlos sets a new Free Immersion record (-101 meters: Hyperlink video to the record) and becomes the first human being in breaking the -100 meter barrier by holding his breath and without assistance; approved by Guinness: Hyperlink to Guinness information about the record and AIDA. The following year, Coste is on a streak and sets two more world records. 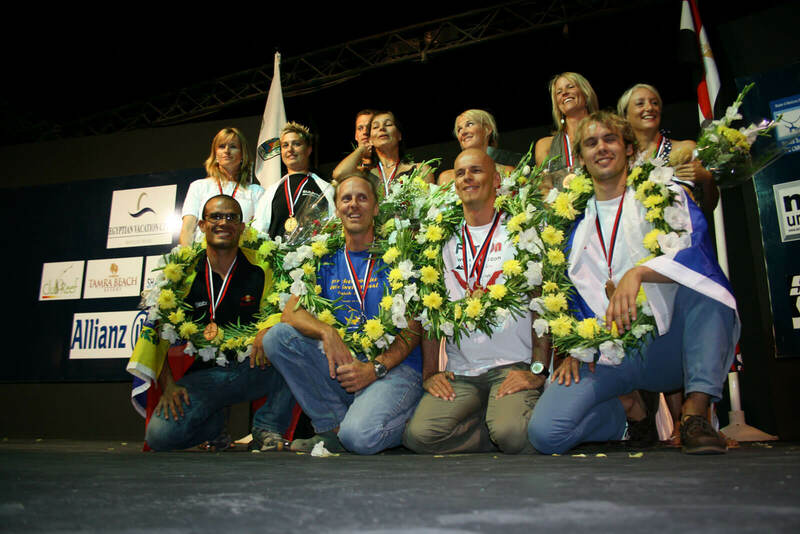 The first one takes place in Cyprus, at the highest level of international freediving, the BIOS Open Classic 2004. Coste with his desire to surpass his limits on constant weight (CW) the discipline all have eyes on during the championship. He puts his name in the books once again that summer with -102 meters. A few months later in October, Carlos sets the Variable Weight ( hyperlink to information plus link to deepsea challenge) world record at -135 meters. In 2005, the AIDA association organized the very first Individual World Championship of Constant Weight in Nice, France. An elite event the most outstanding freedivers of the world attended to and Carlos stands first on the podium with a new world record: -105 meters, a distance that will set him apart from the world’s best; the French. In fact, the record was a shocking distance for “Les Bleus” who has witnessed the same depth distance years back by Jaques Mayol in No limits; the disciplined portrayed in the movie Big Blue. This tremendous achievement was published in the Guinness Book in 2007. 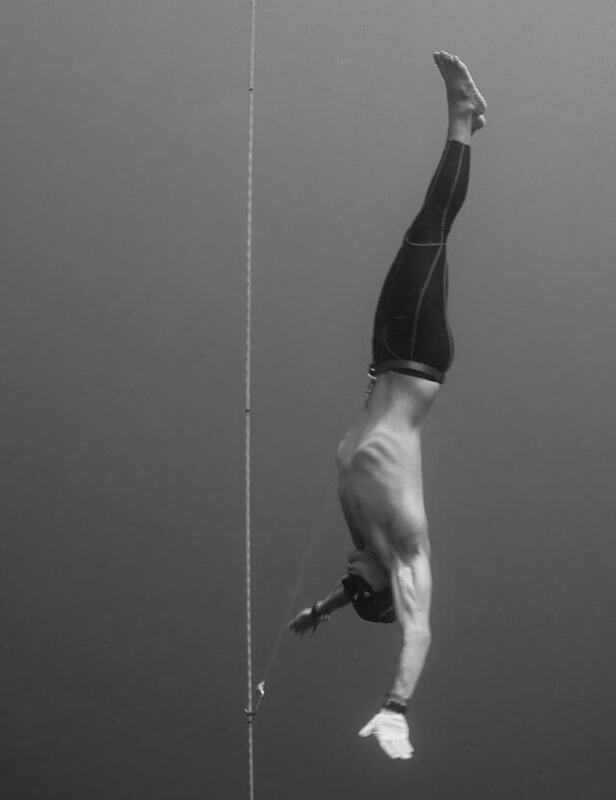 Carlos Coste had done what no other human was thought of doing and earned the Freediving King title among his rivals, because of his unbeatable streak. Carlos had gained the respect he deserved in the Freediving scene. In May 2006, during Reto en el Abismo, an event that had gained the attention of the public and press, took place in Sharm El Sheik, Egypt: Hyperlink to image of the platform at Egypt. Carlos set a new world record (-140m) in Variable weight, a historical day, over 100 freedivers had the privilege to witness this feat. This World record remained unbeaten until 2009. If you would define Carlos, you could describe him as a very determined and dedicated man. His devotion to reach the unknown and to surpass the limits of any other human, leads him to his next challenge: reaching the -200 meter mark in the No Limits; the most extreme and dangerous discipline. Then, Carlos sets a date, September 23th, 2006 in Sharm El Sheikh, Egypt will be the date of the record. 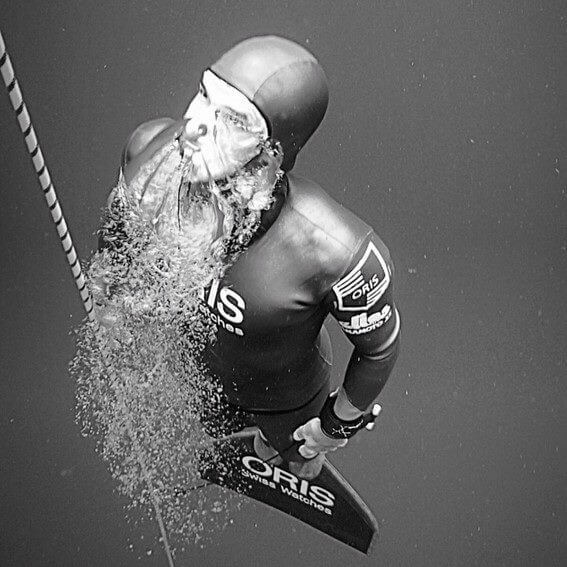 Unfortunately, on the September 12th, on a training day the freediver suffers a stroke after reaching -182 meters (one meter behind the world record to that date). Carlos accident caused brain damage resulting in a partial dysfunction on the left side of his body. After this near sudden death he faced the most difficult time in his professional career. After the accident, Coste was transferred to Murnau, Germany where experts in trauma treated Carlos with the hope of returning his life back to normal. Months were to come, including Fifty-four sessions of Hyperbaric Chamber: Hyperlink to info, neurologic physical therapy, physical and mental training will be the scheduled activities for the following months. Carlos had prepared mentally to reach his next challenge: A full recovery and return to his home; the sea. 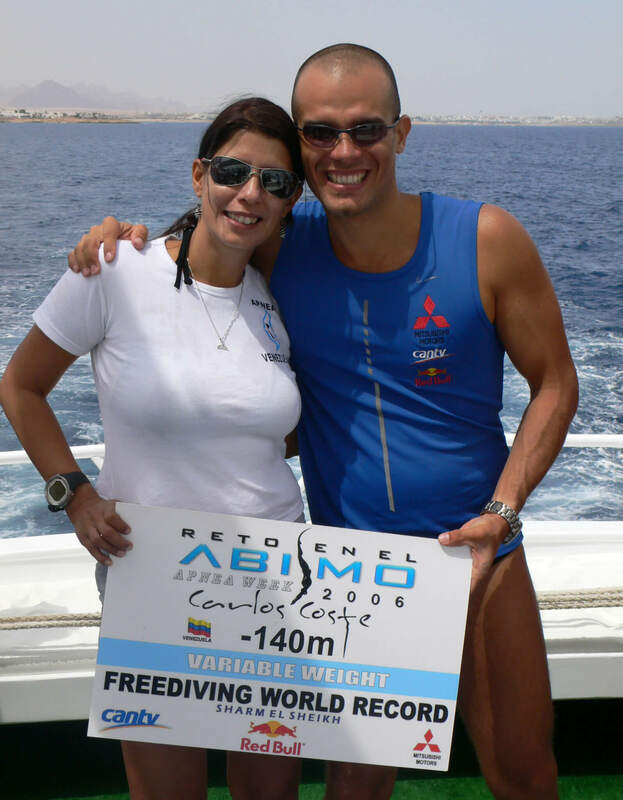 Despite the terrible accident, Carlos Coste has managed to stay among the top freedivers of the world. 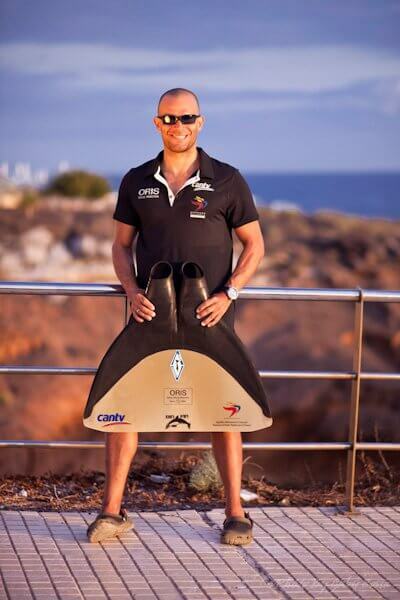 In 2009, he broke new continental records; both in dynamic and in depth freediving. In 2011, he placed second of the world at Greece in Constant Weight and established a new Pan-American record (-116m), one meter below the world’s champion. Coste could be best defined as a passionate sportsman, a man that constantly sets new barriers to surpass and challenges to take. Nonetheless, his passion is shared, since 1999 Carlos has had an unconditional support from Gaby Contreras, his partner, coach and manager; the person who has organized every single world record event. In June 2010, the successful couple decides to get married in small ceremony on a Catamaran in Cubagua Island, Venezuela. Moreover, Coste has continued a gradual formation as freediving instructor. Even so that he has made his life’s work to let people get to know the sport not only through his amazing records but through instructions and workshops. The freediver has also formed very new and talented freedivers. Coming from a life and death experience, Carlos works is a very successful person in showing how powerful the mind can be if you believe in yourself. Until today he’s invited across the world to offer motivational and self-improvement seminars for business and institutes. 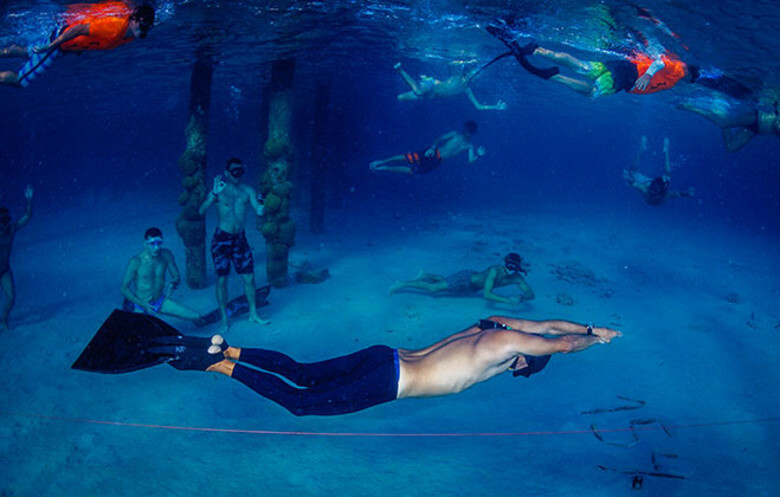 In addition, Carlos is a person that sees Freediving not only as a sport but more as a type of lifestyle. His adventurous attitude to promote and preserve nature has taken him to submerge in the most extreme places. For example, reaching the bottom (-56m) at Laguna Del Santo Cristo, Venezuela: Hyperlink to images of the record, a lake in the Andes at 3900 meters above sea level; extreme low water temperatures and nearly no underwater visibility. Another incredible deed has been the first human being to travel 150 meters in Dynamic Freediving: Hyperlink to information in underwater caves (Cenotes: Hyperlink to world record video) at the Riviera Maya, Mexico; a world record confirmed by Guinness in November 2010. Carlos Coste, a man that has been witness of very incredible endeavors. A man respected by the elite of worldwide freedivers, not just by his competitive attributes but because of his continuous boundary-breaking character. Today Carlos is a 12-time world record holder and has been shown in many national and international broadcasters. Today, Carlos and Gaby reside in Bonaire, on the Netherlands Antilles in the Caribbean. Since 2013, they have worked in the development of the Deepsea Freediving School: An institution with the purpose of promoting the island, the beauty of the sea and the amazing capabilities of the human body through Freediving. In addition, Carlos is preparing for his next challenge: Retrieve a record he once had; surpassing the -145 meter mark in Variable Weight (VW) at Bonaire 17-25 June, 2015. Since 2003, we have been conducting motivational talks both companies, exhibitions, educational institutions, clubs, among others. Through a multimedia presentation where the tools used by Carlos Coste and Challenge team in the Abyss for success are discussed. 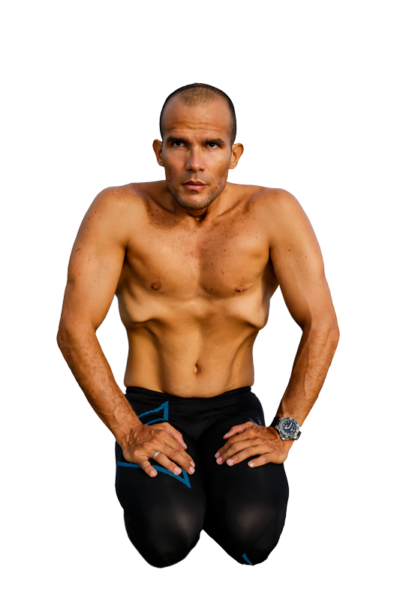 Coste has fought 9 world records, has achieved multiple Guinness World Records and has won a World Championship during his short career as a freediver. 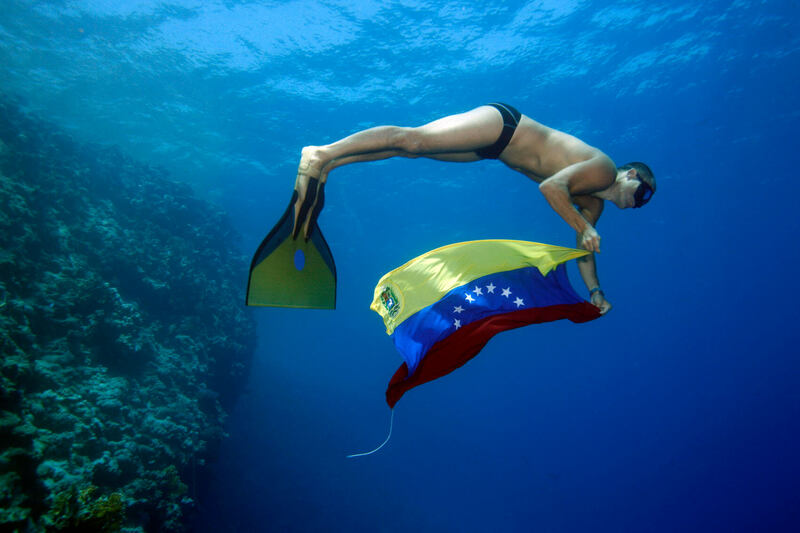 He proudly carried the flag of Venezuela to the depths of different seas and putting our country in the lead sports diving or snorkeling. In the talks Carlos Coste and / or Gaby Contreras, his manager, coordinator of the Abyss Challenge, disclose what they have called the 5 keys to success, which is not rather than its methodology to meet goals, to face challenges and overcome obstacles through his experiences as an athlete and manager respectively. Depending on the time required can vary from 30 min. up to two hours, we adapt to your needs to expand a topic more than another always based on our experiences and working methods. Following the call of some institutions and companies, Carlos and Gaby experiential workshops have been prepared to complement the motivational lectures. Workshop which varies from half day to two days and can offer from a respiratory clinic as a basic tool for improving the quality of life and concentration when facing challenges and overcoming stress situations. Until controlled risk challenging activities that are performed in the water, which helps them explore their capabilities and limitations, assume roles, decision-making to solve problems and achieve goals. These life experiences in a simple way, in a short space of time, produce a transformative impact of these talented individuals to groups of more efficient work, with lasting results, playing the entire organization transcending the personal and social level.